Funding for Bretton Water Park, increasing on-street parking prices and leaving funding for a bridge at Fletton Quays - these are all proposals put forward by the Labour group on Peterborough City Council for its alternative budget. A fortnight before the Conservative-run council’s budget is voted on, Labour has presented its own proposals.
. Investing £6 million to use empty buildings as temporary accommodation. The costs are expected to be recovered through rental income. Labour group leader Cllr Ed Murphy said his party’s proposals, which have been signed off by council officers, would save £292,000. 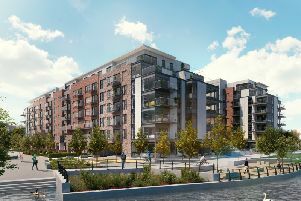 This would leave money to fund a foot and cycle bridge between the Embankment and the new Fletton Quays development, which is wanted by all parties, as the estimated revenue cost would be around £200,000 a year. Labour is also proposing to scrap the costs for replacement bins, but Cllr Murphy said he was not yet able to explain the full details of the policy. It is also proposed to keep the cost of paying for a brown bin at £39 (instead of the £45 proposed by the Conservatives) but to introduce a £30 charge to have a second brown bin collected. All other Conservative budget proposals, including a six per cent council tax rise, would be kept by Labour.